Sometimes it pays to avoid controversial topics because people will dissect you if you poke the bear. PC Gamer executive editor Tyler Wilde just learned this one the hard way. Wilde posted a column on PC Gamer advocating for the end of the term “PC Master Race” (while making some comparisons of the term to the Nazis) but I don’t think he expected what the fallout would be. While he had to weather the unfortunately expected personal attacks, he also had his personal life dragged into the matter. That’s because Wilde is dating a communications specialist for Ubisoft while still writing about Ubisoft for PC Gamer without disclosing his relationship. Redditor user yuut0 seems to have dug through Wilde’s Twitter feed and found out that he’s in a relationship with a communications specialist for Ubisoft. User chocolatestealth says that going through their tweets indicates that they’ve been in a relationship since May 2013. Over the course of 2014 alone, Wilde has written at least five articles about Ubisoft games. One of those articles was a preview for Watch Dogs while the rest were more news-ish articles about Ubisoft trailers or press releases. From /r/KotakuInAction, here is a link to a compilation of articles and tweets showing Wilde’s relationship and reporting. Suffice to say that there is some merit to the accusations being levied at Wilde. It’s not just Reddit on the case, TechRaptor has confirmed this relationship and story as well. 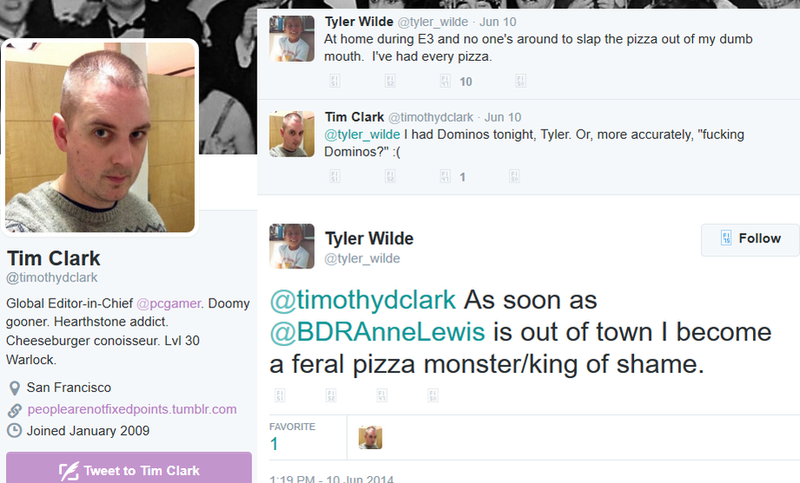 Not making anything better for PC Gamer is that editor-in-chief Tim Clark knew about their relationship no later than June 10, 2014. On that day, Wilde wrote two Ubisoft articles with another in August. Of course, even if you give PC Gamer and Clark the benefit of the doubt, that’s only one article that went posted and undisclosed by PC Gamer’s EIC. That’s not including at least a year-and-a-half where Wilde didn’t self report a conflict of interest. I know the joke about #GamerGate is that “it’s really about ethics in games journalism” but there is actually a problem with ethics in games journalism. Right now, the CBC is being raked over the coals because one of their news personalities tried to spike coverage of a story about a major bank using foreign workers while she was making paid appearances for the bank and in a relationship with one of the bank’s board members. Is anyone claiming that is about misogyny? No, that’s about journalism. I know we don’t like calling folks who write for gaming news sites journalists but there has to be some level of ethics if you’re reporting news. Just like my biggest issue with the whole Zoe Quinn affair was really with Nathan Grayson and Kotaku, my problem here is with Wilde and PC Gamer. That’s why I don’t mention her name explicitly in this post. As far as I know, the major ethical burden is on the journalist and his employer. They have to disclose that there is a conflict of interest in Wilde being anywhere near a Ubisoft article as long as he’s in a relationship with a Ubisoft employee. Now let’s leave this one as just about ethics in games journalism and nothing else. For more from et geekera, follow us on Facebook, Twitter, Google+, Tumblr, Steam and RSS. Steve is the founder and editor of The Lowdown Blog and et geekera. On The Lowdown Blog, he often writes about motorsports, hockey, politics and pop culture. Over on et geekera, Steve writes about geek interests and lifestyle. Steve is on Twitter at @TheSteveMurray. Posted on January 16, 2015, in Games and tagged Ethics, Games Journalism, PC Gamer, Ubisoft. Bookmark the permalink. Leave a comment.